尹建国, 张社兵, 彭道泉. 载脂蛋白AⅠ通过诱导自噬抑制泡沫细胞脂质沉积和凋亡[J]. 中国医科大学学报, 2018, 47(1): 17-21. Yin Jianguo, Zhang Shebing, Peng Daoquan. 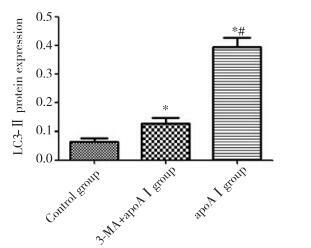 Apolipoprotein AⅠ Inhibits Lipid Retention and Apoptosis in Foam Cells via Induction of Autophagy[J]. Journal of China Medical University, 2018, 47(1): 17-21. 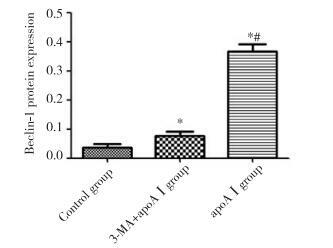 Abstract: Objective To observe the effects of apolipoprotein AⅠ (apoAⅠ) on autophagy, lipid retention, and apoptosis in foam cells, and to explore the anti-atherosclerotic mechanism of apoAⅠ.Methods Macrophages derived from THP-1 cells were randomly divided into the control group, the 3-MA+apoAⅠ group, and the apoAⅠ group. 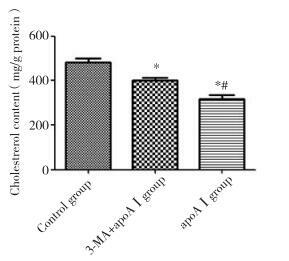 Each group was administered oxidized low-density lipoprotein for 36 hours, then lipid droplets and autophagosomes were observed and cellular cholesterol content was quantified. LC3 and Beclin-1 expression was examined by western blot and the apoptotic ratio determined using flow cytometry.Results Compared with the results of the control group, apoAⅠ treatment inhibited lipid retention and apoptosis in foam cells, decreased cellular cholesterol content, and up-regulated the expression of LC3 and Beclin-1 (P < 0.01). 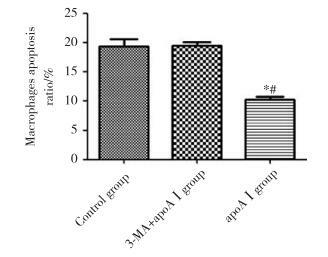 Administration of 3-MA abrogated the effects of apoAⅠ(P < 0.05).Conclusion ApoAI inhibits lipid retention and apoptosis in foam cells by inducing autophagy.